HO scale brass trucks - sorry I cannot identify these. Quantity: 1. Get Supersized Images & Free Image Hosting. A real nice pair of highly-detailed new brass tender trucks. Sprung trucks are 14ft in length at full scale. The rack between the rails is required for operation. The wheelsets are not powered (see 2nd photo). The model is Painted. The model is Used. The photos were taken on a flat bed scanner so all details may not be clear. Scale: 1:150. - Each has single head, completed with wires and bulbs. - Mainly used to decorate your model layout. We will get back to you as soon as we are available. - Main Color: White. Scale: 1:150. We will solve your problem as soon as possible. 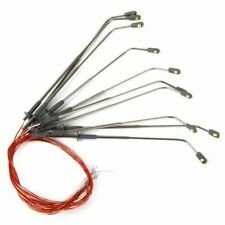 - Each has single head, completed with wires and bulbs. - Main Color: White. - Mainly used to decorate your model layout. We can also remittance your money despite the good or proper products. Mainly used to decorate your model layout. - Scale: 1:150. We will solve your problem as soon as possible. - Each has single head, completed with wires and bulbs. We can also remittance your money despite the good or proper products. Mainly used to decorate your model layout. - Scale: 1:150. - Each has single head, completed with wires and bulbs. - Main Color: White. We will get back to you as soon as we are available.